"Do you realize that we are the oldest people here?" my husband whispered in my ear. "Yes!" I replied. "I was just noticing. When did THAT happen?!?!" We were attending our niece's third birthday party. As David and I stood together looking out over the rest of the scene, there were swarms many little ones running around dressed up in princess dresses and superhero costumes. There were moms wearing sleeping infants and dads bouncing or bottle feeding babies. Meanwhile, our three daughters were the "big kids" who were helping with princess hairdos, temporary tattoos, and painting tiny fingernails. On the way there, we had been discussing the oldest one's impending Driver's Education classes. Now, as we stood there, we found ourselves in some kind of alternate universe. Age never used to bother me and I always used to say that people just need to relax about birthdays and turning the next big number. Until recently, anyway. You see, my 40th birthday is just around the corner and, suddenly, my "age is just a number" attitude has turned into a "Screw you, 40!" outlook. I want to flip 40 the bird, cuss it out, and punch it. It's messing with my mind and my emotions and I really just want to fast forward a few weeks to my birthday and get it over with - or, better yet, to a few weeks after my birthday when I can look back and say I survived. What makes 40 so bad you ask? Well, I'll tell you. For starters, I started gaining weight a couple years ago. Despite dieting and a gym membership, I gained more (and didn't lose any). Good news - after two years, it seems that perhaps I have "settled in" to my new weight and stopped gaining. Bad news - that weight is 40 pounds and 3 pant sizes larger than I want to be. Next, is the crazy hormones. I get so grumpy that I get on my own nerves and the next minute I'm tearing up over some song on the radio. It's not just once a month, either. It's ALL. THE. TIME. It's like I have PMS 24 hours, seven days a week! 😫 I'm sure my husband and kids think that I'm completely losing my mind. Maybe I am. Also, it's like my biological clock has morphed into a ticking time bomb. After having my third baby, I was completely done having kids - never any doubt about it for me. I've never had any desire since then to have another baby and I've enjoyed the changes as my kids got older. In the past, if I was at a birthday party surrounded by a billion toddlers and crying babies, I'd be thinking "Better you than me!" Now, it's not so much that I want to get pregnant and have another baby (Heck no!! ), but that I really, really miss when my girls were babies instead of the moody, surly tweens and teenager they have become. I miss my days being filled with dirty diapers and nap times, instead of precalculus, teacher conferences, and slamming doors. I want to zap my girls back into squishy little nuggets of pink and cuddles again. 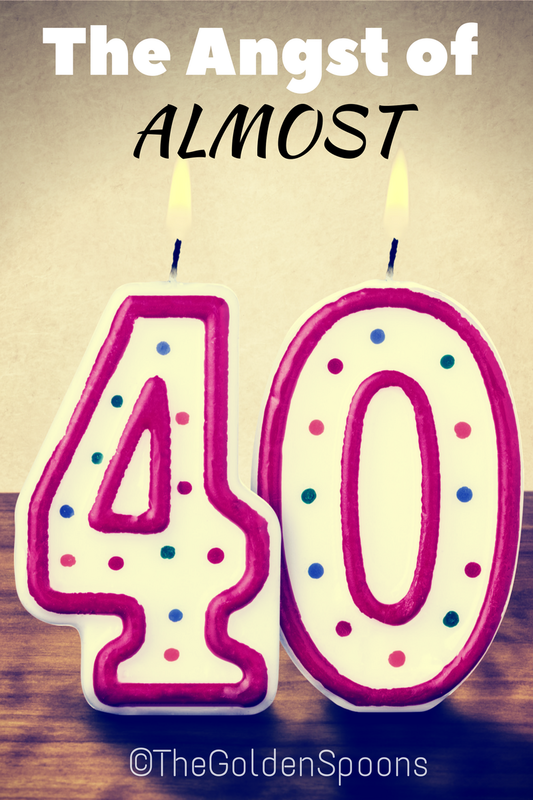 For many of my friends and family, turning 40 is a memory in their rearview mirror. They all survived, perhaps with the help of some new reading glasses or vitamin supplements and the addition of a few extra pounds, but they survived. I'm sure I will, too. I will conquer 40 and everything that comes with it. I'm hoping to discover that the angst of being almost 40 is actually much worse than the reality of being actually 40. Eventually, I'll hit 50 or 60 and, then, 40 probably won't seem so bad. For now, though, I'm going to wallow in self-pity, keep cursing under my breath, and go apologize to all the people I ever said "Age is just a number!" to. Have any big birthdays been hard for you to swallow?